The ultramodern and architecturally intriguing Canadian province of Ontario has attracted our attention today, and we are here to explore the length and breadth of a stunning residential bathroom. The Sudbury Home Builder’s Association of Residential Excellence recently presented it with the prestigious Residential Award of Excellence. And you will soon discover why! Elegant and carefully chosen materials, sober hues, luxurious designs and minimalistic touches make this bathroom a sanctuary of sorts. You can wash away all your worries here, surrounded by glitz and glamour. Credit for this wonderful creation goes to the interior designers and decorators at Shellshock Designs. Pure white freshwater Mother of Pearl hexagonal tiles and Black Lip seamless Mother of Pearl tiles have come together in this very contemporary bathroom for a look and feel you won’t forget. Sophisticated shades of grey and white dominate this space, with touches of black offering a hint of boldness. The linear room has been effectively utilized to house the shower cubicle, bathtub, vanity counter and WC. Also note how wall-mounted rods help in organizing towels thereby reducing floor clutter. The twin mirrors are contemporary and lavish, and reflect the ceiling light stunningly. The slightly wavy vanity counter features exotic sinks and mirror-finish drawers which add to the glamorous ambiance. 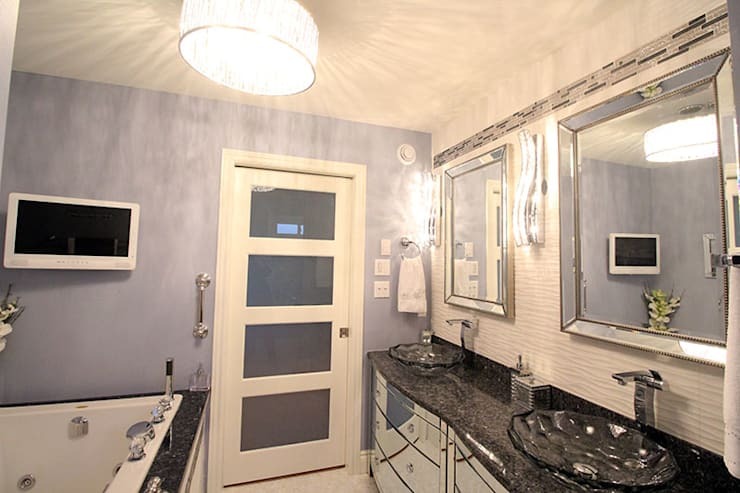 The stylish sconce lights and white and frosted glass door add extra oomph as well. 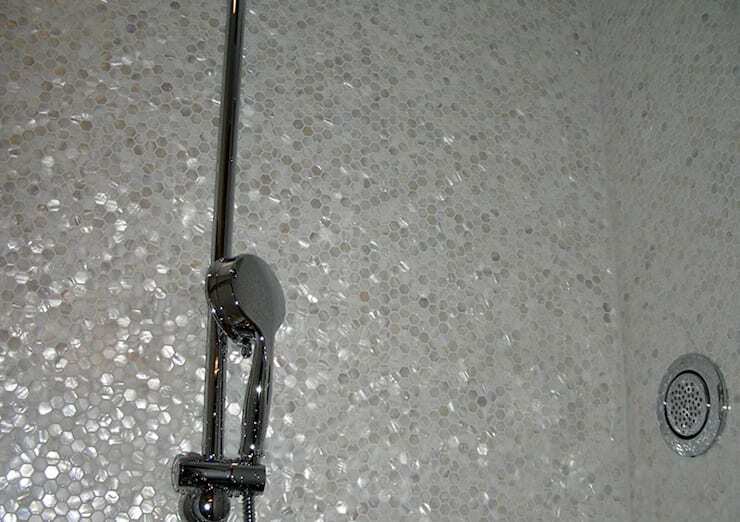 The Mother of Pearl tiles lend the shower cubicle a lot of jazz, while the rain shower promises to wash away all your exhaustion in seconds. The large and luxurious tub is perfect for a hot and refreshing soak, while you watch your favourite show on the wall-mounted TV. A bunch of flowers adds natural freshness to the tub. Sleek and gorgeous niches like these add oodles of utility to the bathroom. 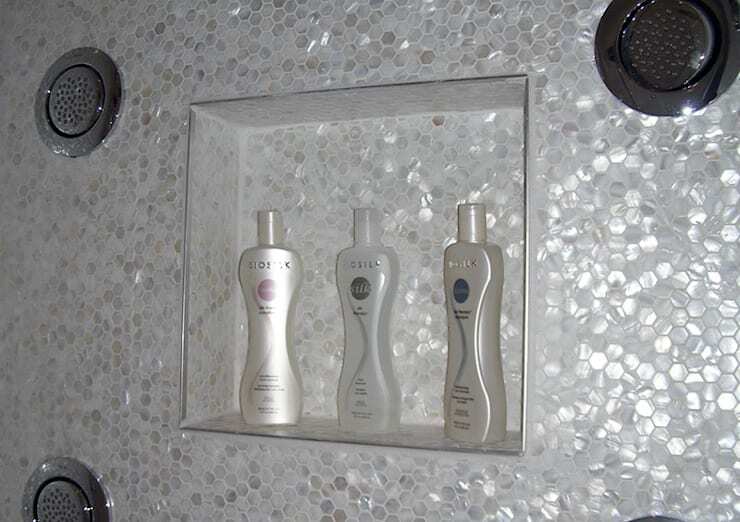 This niche in the shower flaunts the soft and distinct shine of Mother of Pearls tiles especially well. Minimalism is the watchword when it comes to the fixtures in this bathroom. They are sleek, gleaming and extremely modern. Naturally, you don’t just feel uniquely refreshed but find the fixtures great to look at as well. 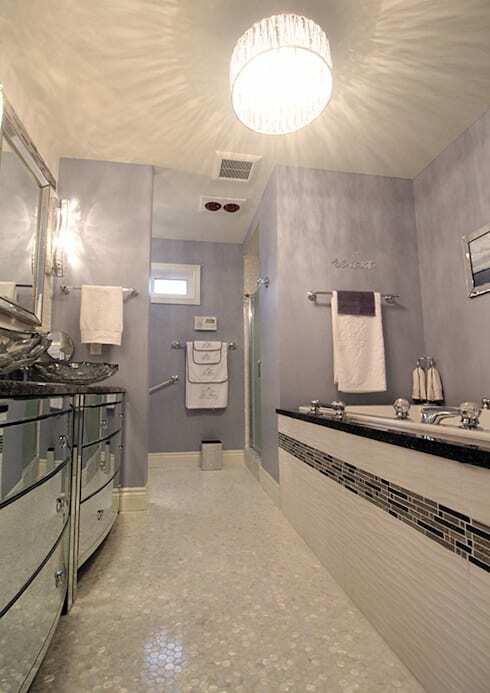 Has this exotic bathroom inspired you to create a fabulous rejuvenation space for yourself? Then contact interior architects or designers o help you out. In the meantime, enjoy another tour here - This Oddly-Shaped Home Steps Up In Style.